Co-founder of the International Post-Dogmatist Group, director of the group's Ontological Museum, founder of the International Museum of Collage, Assemblage and Construction and founder of the International Society of Assemblage and Collage Artists. Cecil Touchon is a very personable, generous artist who loves sharing ideas, his own art and his theories on art. He is very articulate and enthusiastic, curious, and thoughtful in his remarks. He has influenced the work of countless artists, and his works have been included in private and public collections around the globe. His works are included in the permanent collections of the Museum of Modern Art, New York, NY, the Museum of Contemporary Art, Chicago, IL, the Tate Modern, London, UK, The Getty Research Institute, Los Angeles, CA, the Walker Art Center, Minneapolis, MN, the Fogg Museum of Art Archive, Cambridge, MA, Archivo Francesco Conz, Verona Italy, and the Glasgow School of Art Library, UK. It is through his work in collage that he has made a lasting mark on the world. He creates collages where he deconstructs found language, dismantling text from all kinds of sources including street posters, old books, emails, fabricated papers, etc. He cuts them up into sub-letter units and reassembles them into collages that are new forms of order. Stripped of literary meaning, these works rely on composition, rhythm and visual movement to convey their meaning which is ambiguous and intuitive. Then, he often replicates them into paintings using trompe l’oeil techniques. Touchon speaks of his practice as “liberating the forms of language from the practical utility of being carriers of some commercially driven corporate message……allowing them to exist purely for their own sake as shapes, curves, rhythms and color.” He sees himself as playing around with the fabric of consciousness below the area where it actually manifests into meaningful word structures. Touchon makes visual poetry where he explores the boundaries of art and poetry. Visual poetry came about in the 1950’s as a development of concrete poetry but with the characteristics of intermedia in which non-representational language and visual elements predominate. 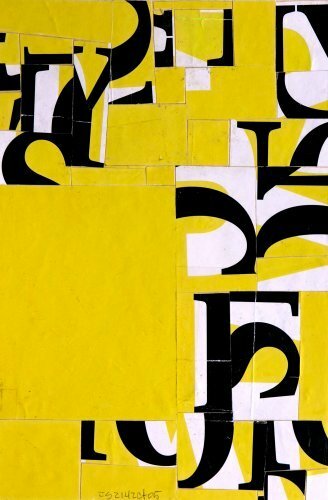 Visual poetry is written for the eye, but its methods and intentions, even in those works most limited in their verbal content, are always poetic, always compelling the reader forward into the transformative power of language, always entranced by—and entrancing through—the text that is before us. Touchon saw rearranged snippets of lettering almost become recognizable letters or perhaps proposals for a new poetic alphabet but always slip back into forms and spaces creating the possibility of enigmatic and open, simultaneously plausible interpretations. One of Cecil Touchon’s ambitious projects, is his creation of the International Museum of Collage, Assemblage and Contstruction. He has had over 1500 artists donate works to the museum in the past 10 to 12 years. Touchon claims he has created a resurgence in collage art through his collection.